The Pulitzer Prize–winning journalist (1900–45) collected his work from WWII in two bestselling volumes, this second published in 1944, a year before Pyle was killed by a sniper’s bullet on Okinawa. In his fine introduction to this new edition, G. Kurt Piehler (History/Univ. of Tennessee at Knoxville) celebrates Pyle’s “dense, descriptive style” and his unusual feel for the quotidian GI experience—a personal and human side to war left out of reporting on generals and their strategies. Though Piehler’s reminder about wartime censorship seems beside the point, his biographical context—Pyle was escaping a troubled marriage—is valuable. 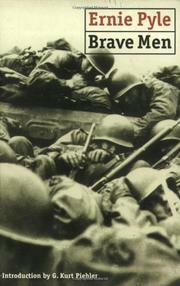 Kirkus, at the time, noted the hoopla over Pyle (Pulitzer, hugely popular syndicated column, BOMC hype) and decided it was all worth it: “the book doesn’t let the reader down.” Pyle, of course, captures “the human qualities” of men in combat, but he also provides “an extraordinary sense of the scope of the European war fronts, the variety of services involved, the men and their officers.” Despite Piehler’s current argument that Pyle ignored much of the war (particularly the seamier stuff), Kirkus in 1944 marveled at how much he was able to cover. Back then, we thought, “here’s a book that needs no selling.” Nowadays, a firm push might be needed to renew interest in this classic of modern journalism.